Born in Berkeley, California and hailing from Minnesota's Twin Cities, Greg Stuart is dedicated to expanding new music for percussion through commissions, improvisation and mixed-media projects. His current work is centered around pieces from the experimental tradition, the Wandelweiser Collective, and an ongoing collaboration with the American composer Michael Pisaro. Since 2006, Stuart and Pisaro have been producing evening length works in the form of multi-channel recordings. These works employ diverse instrumentations in large ensemble formations and are often combined with live performance. Stuart was a member of the acclaimed percussion ensemble red fish blue fish (2000-2008) with whom he performed in concert series and festivals including the L.A. Philharmonic's Green Umbrella Series and the Bang on a Can Marathon. 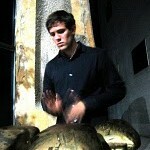 In the fall of 2007 with red fish blue fish and percussionist Steven Schick, Greg Stuart participated in the world premiere of Roger Reynolds’ Sanctuary for percussion and real-time electronics at the National Gallery of Art in Washington, DC . 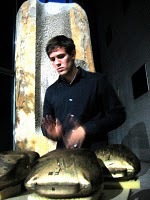 Stuart has recorded extensively performing works by Xenakis, Stockhausen, Reynolds and Scelsi. Stuart holds DMA and MA degrees from the University of California, San Diego where he studied with Steven Schick. Stuart is currently a Visiting Assistant Professor at the University of South Carolina in Columbia, SC where he teaches composition and music history and a Visiting Lecturer at Claflin University in Orangeburg, SC where he teaches percussion.